Simplify your kitchen with this amazing countertop appliance. Stop spending hundreds of dollars on cookware. Imagine a griddle, waffle maker, grill, omelet plan and even a donut maker all in one! Save yourself kitchen space and make quick and easy meals for you and your family. 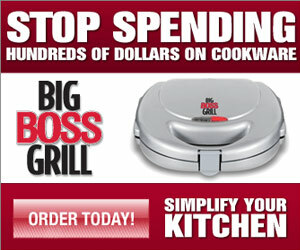 You’ll also get a recipe book, plate storage rack and the Big Boss Chopper!